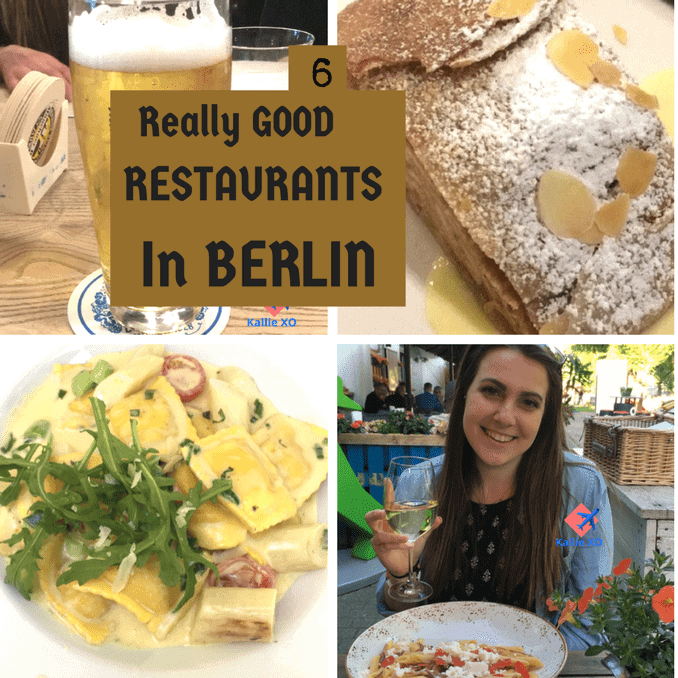 As a serious foodie, you can only imagine my delight in finding stupendous eateries, bars, and restaurants in Germany. The surprise was the different ambiances available. From waterside to traditional indoor dining I enjoyed it all. 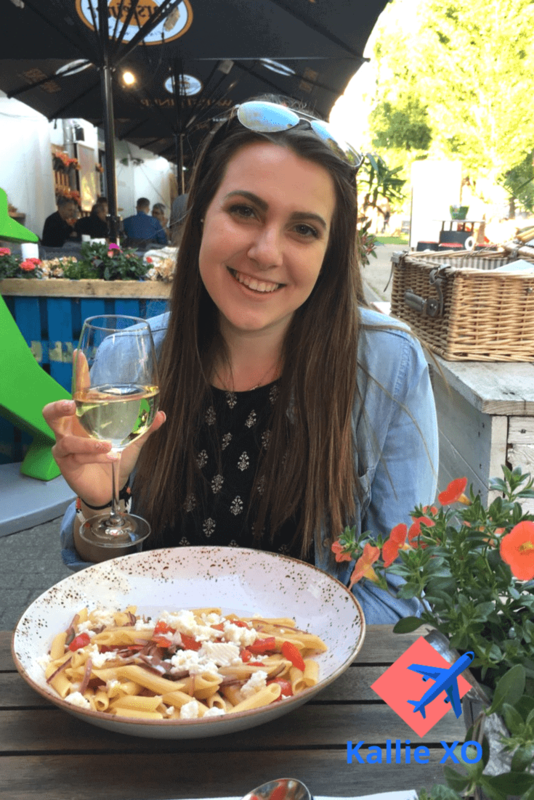 Truthfully I did eat a good bit of Italian food in Germany. After all, you can take the girl out of Italy but you can’t take the Italian out of the gal! LOL! Remember I am here on a College Trip for Political Science. Every chance I get, my friends and I head out to discover great foods and destinations. These are just 6 really good Berlin restaurants you want to know about. Some offer WiFi, some offer great prices and some are just delicious. Lavishly live travel out loud and enjoy. As a daughter of a travel writer, my mom has taught me one thing: “travel is only as good as the culinary tastes” and she is so right. I am Germany, with my some of my college friends on a political science trip. We get plenty of time to go around on our own and I have used that time to curate a small list of a few places we traveled to. To be honest, I was thankfully not on a budget, so I chose what looked good, as did my friends. We all just wanted to have the best time and eat well. Here are my finds and they actually all ended up being super reasonable. Last, please know this was not sponsored travel nor were my meals sponsored. Just Kallie Vento sharing what I found! 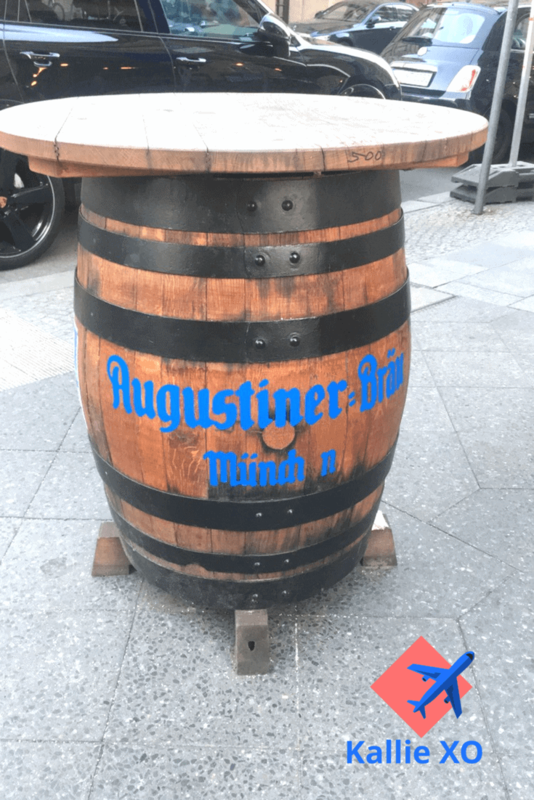 Zille Stube – When In Berlin!!! We stopped in Zille Stube it is truly authentic German Cuisine. It is smack dab in the middle of the historical Nikolaiviertel. What an ambiance, great German food and Berlin music. The walls are loaded with cool ‘stuff’ too. So I did eat German food and this is just one occasion. Guess what’s on my plate and don’t just say chicken because you are wrong! Chicken breast fillet topped with cheese and tomatoes and a Paprika cream sauce served with a side salad. Those ‘things’ that look like mozzarella sticks are potato croquettes. Please get your DROOL off the screen thank you. The cost of this may flux but it was only $14 US Dollars. Hooray! Reasonable and tasty! By night I might suggest a bit more of upscale dressing, like nicer pants, and sweaters, etc. It had that feel but nothing mandatory. Just in case you want to know. Business casual would be fine. Oh, my foodgasm as my mom might say! The burgers and fries here are super good and may give the old USA a run for their money. Yum! Outdoor and indoor seating. We sat inside because of odd weather today. This was only $8 US Dollars and we loved being here because we are the legal drinking age. The cocktails are great and the vibe is fun! Also, Free WiFi which is a big deal. I snapped a lot while I was in here so I could chatter with my US friends. A very casual place to hang and dress casual like jeans, tees, etc. 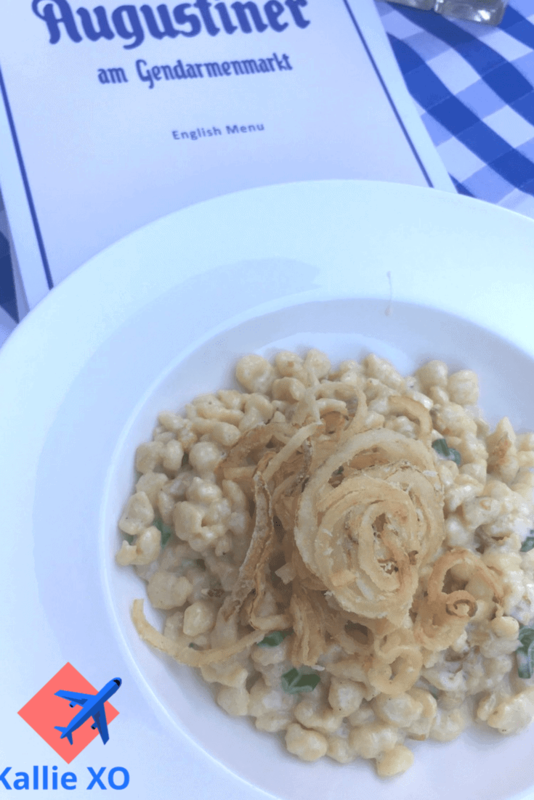 It is time to get your Italian on! Get a little dressed here. You can dress up or be business casual but less would not be better. Oh, this is the best date place, cozy and romantic, but let’s be serious I was here for school, not the dating thing! Wine is a must when you are here, it solidifies the ambiance. A bottle or two, just kidding, but get a glass. 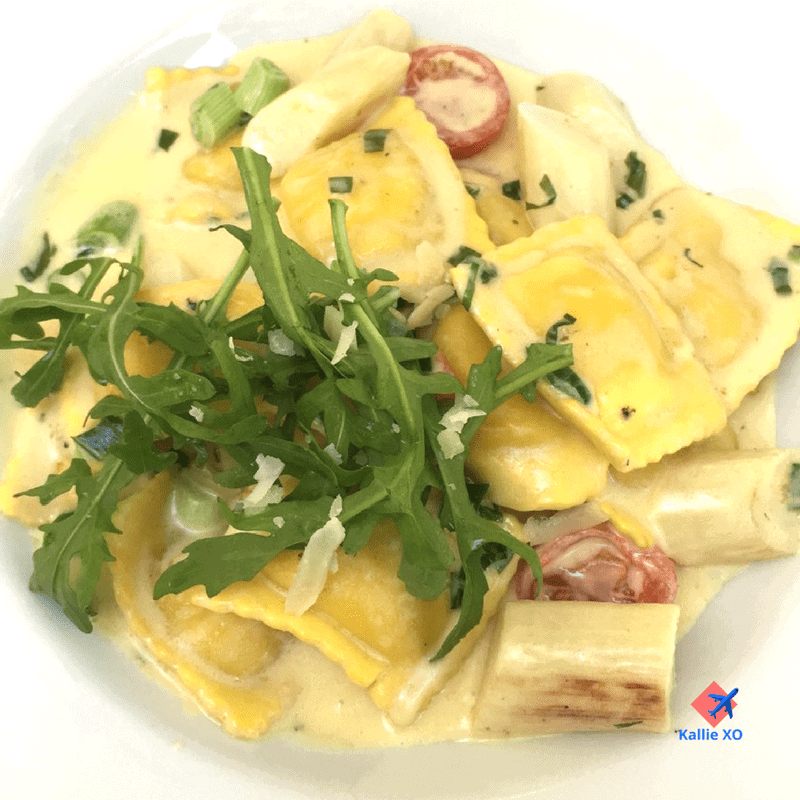 Italian is the food theme and delicious is the taste. 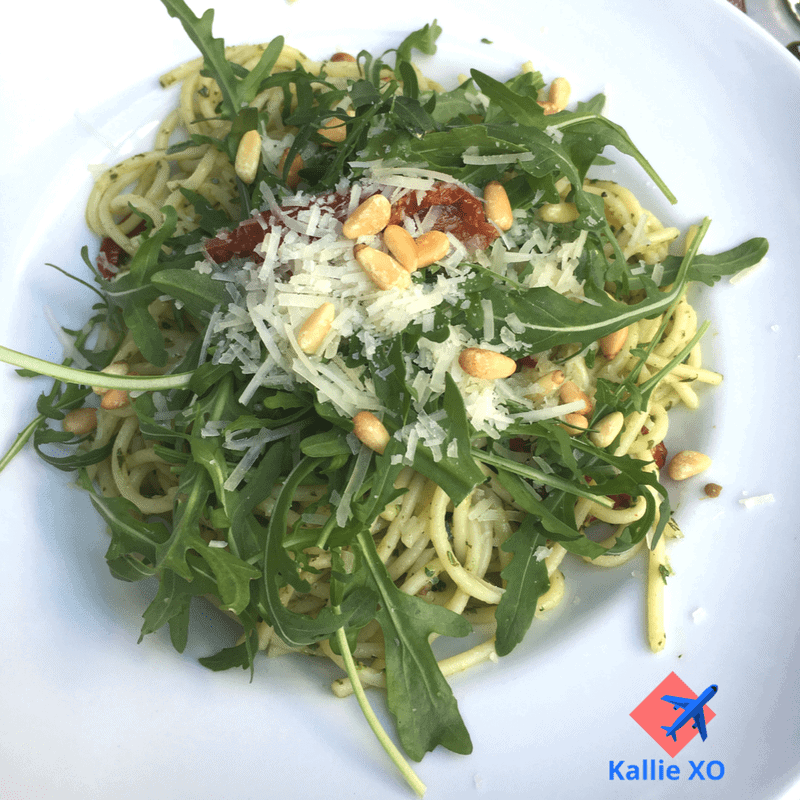 Fresh pasta, in a pesto sauce with pine nuts, parmesan and a bed of arugula. I need more of this! It was so perfectly portioned and full of taste. Wildly magnificent and the cost was under $15 to dine! We dined here (we as in me and friends) a few different times, the food is so good. The prices are fair but do not look for CHEAP Eats, you get what you pay for. Pork Knuckle and Beers holy good food and beer. My first meal after landing and one of the best! 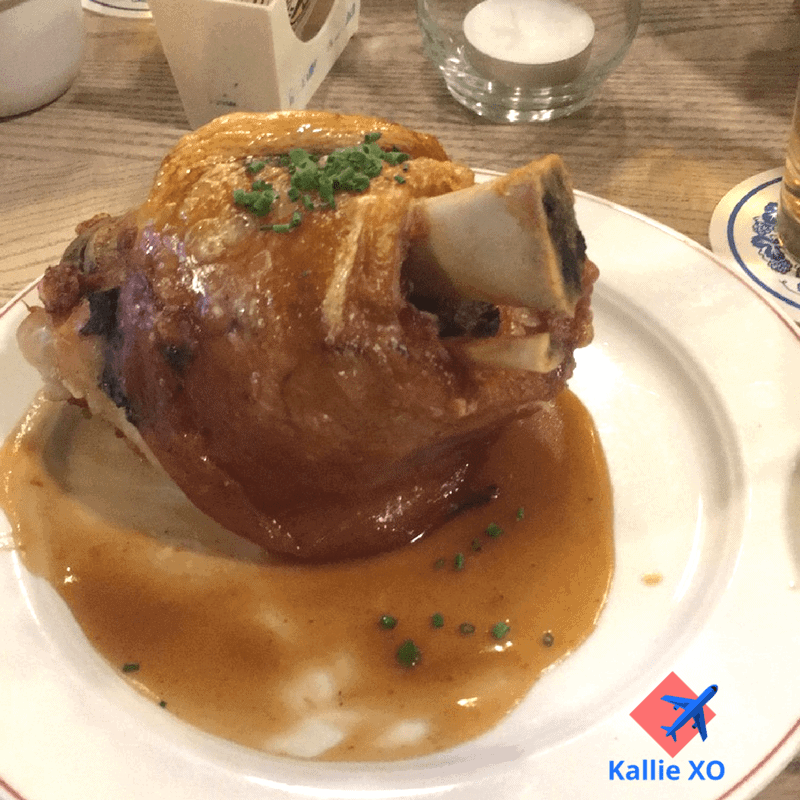 The pork knuckle was crisp and in one piece. I ate the whole thing I was starving and it was delicious. It came with Bavarian cabbage! Running about $21 for the meal. I also had a few beers, which were a few dollars each. 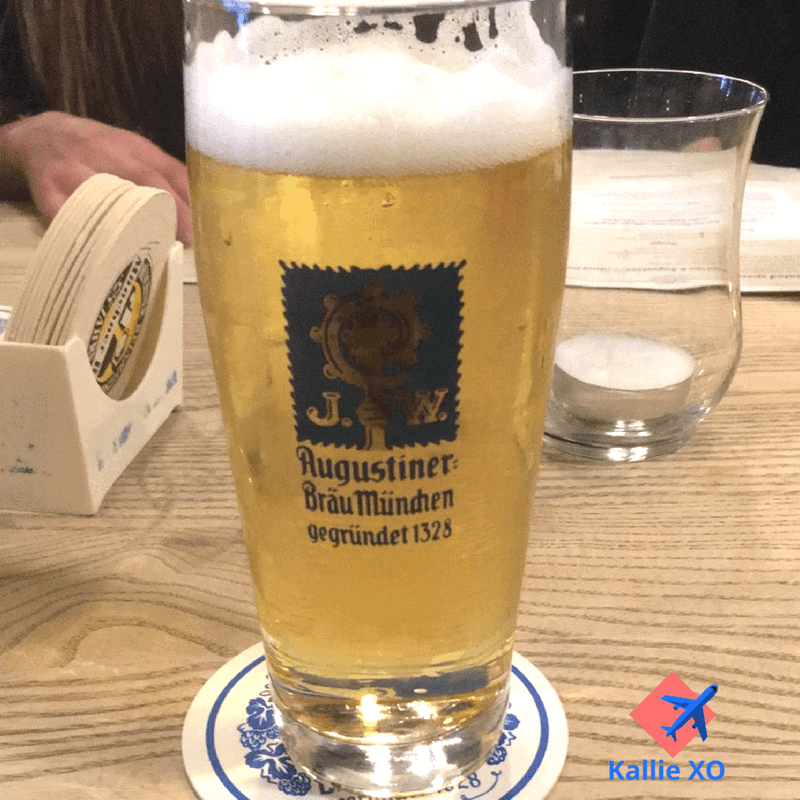 When in Germany….Now another evening I went back and enjoyed this fabu meal. 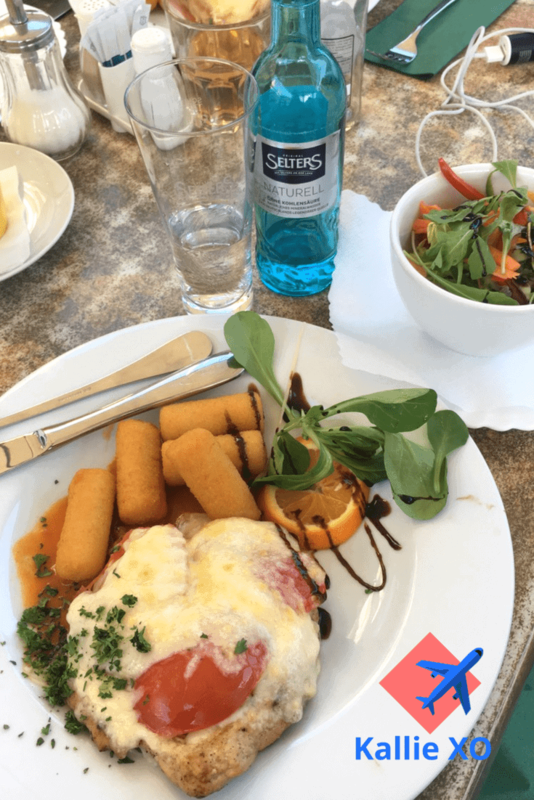 Cheese noodles Allgäu with small mixed salad. You bet it was delish. Sorry, it looks blue the color somehow messed up. I was not going to share but seriously it is too good not to show you. Maybe a better look at it this way front and center? I mean it takes a beer to make things better so let’s do it! There a much better picture. Maybe the beer was why the pic turned blue. Just kidding, a little German humor for you. Beer is a staple everywhere and the taste is sweet not like our American Brews. It is different, almost hard to describe. In America, I do not like to drink beer. The Grand Finale is strudel and I say, “Keep filling my plate up.” Sweet, flaky, yet not oversweet. Crusty and delectable, light, airy, everything you want it to be and more. 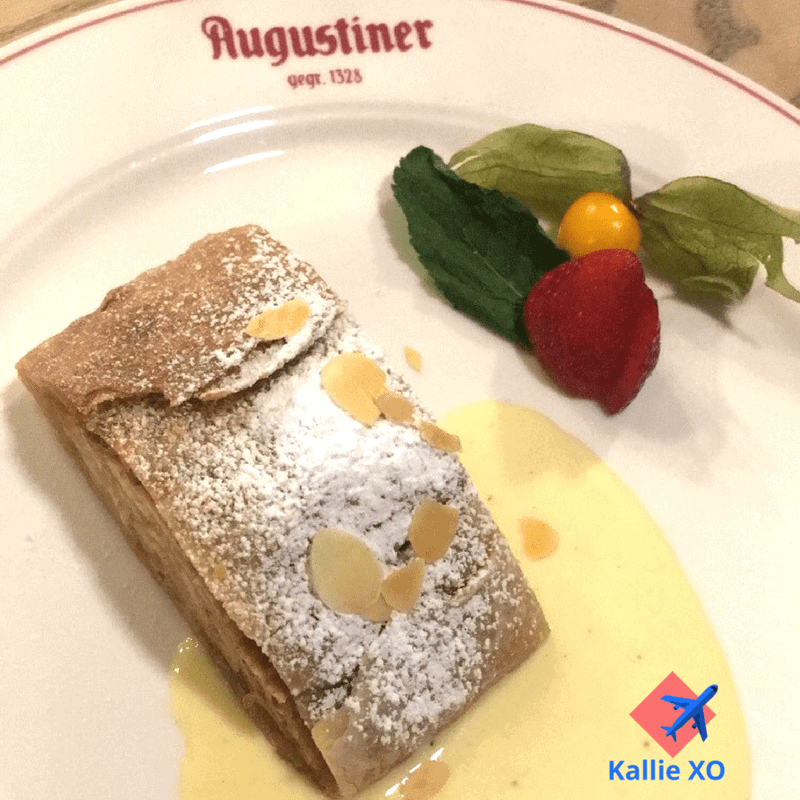 Meet warm apple strudel with a Vanilla Sauce. How good it is! Penne, red peppers, feta cheese, and onions, probably other stuff I don’t know about, but totally delish! 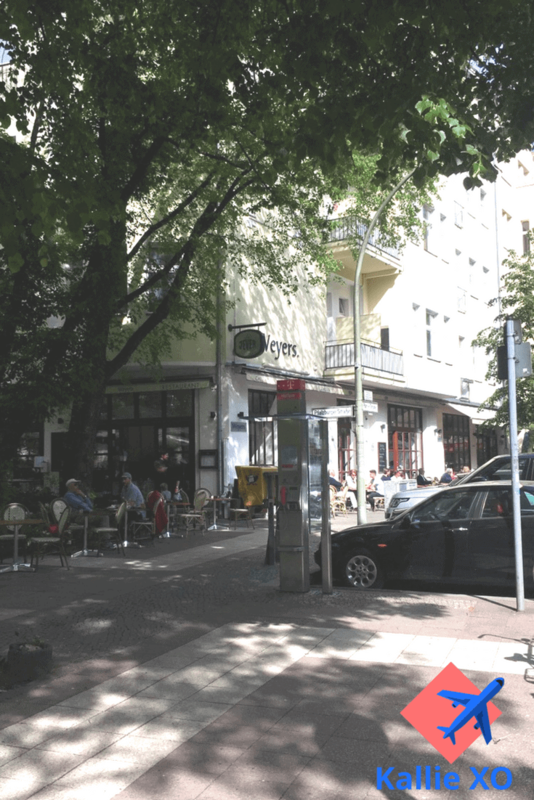 Find AMPELMANN restaurant in the historic S-Bahn bows near the Hackescher Market. We loved the ambiance, so hip, and so urban. Trendy dining and affordable. This meal and the wine $14. Yep! Really delicious too! That bowl is deep and loaded total food fest! Seek this place out and do not stop until you find it. Oh is it good and so really inexpensive? The meal was by far the talk of all who joined in. Outdoor, delicious, inexpensive and really for lack of a better word FRESH. We loved that we could sit outside, what a plus. A cafe environment. Outdoor dining, elegant eats, and mint tea to die for. Yes, that is what you will find at WEYERS Restaurant. Stop, go no further a treat of treats awaits you here. Look how quaint. love it. On My Plate: Asparagus ravioli with wild garlic sauce and a small salad. White asparagus, not the traditional green. It is Asparagus season here in May and every dish celebrates it. This was perfection. And mint tea that will just send you to a new universe and back. I never had tea brewed like this. Love the fresh mint in the brew. It looks like an amazing visit you had there, Would love to visit it someday and Can’t wait to taste the food. Ok my favorites would be the pork knuckle looks so sweet and delicious. Plus the burger and fries look so tasty. You found a great amount of spots and the price points weren’t so bad. 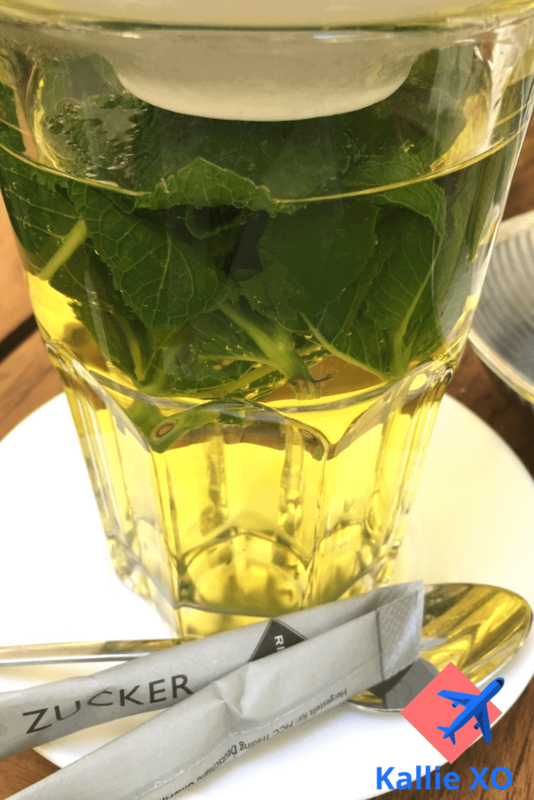 The mint tea looked super refresyas well. A side of Berlin I’m always eager to learn more about! Food is as expected, quite amazing and I love the variety. And that’s some Asparagus, I wish we had special feasts for that here.